Sandals/Flip-Flops: Mostly worn in summers, flip flops or sandals are a great freedom to your feet but it does have one disadvantage i.e. proper support! Many flip-flops or sandals are not properly built to provide support to the feet, thus causing ankle to sprain or heel to ache. The best solution for this is – buy those sandals or flip-flops which are designed properly and are good enough to keep your feet in place while walking. Athletic Shoes: Quite shocking to see this shoe in this list? 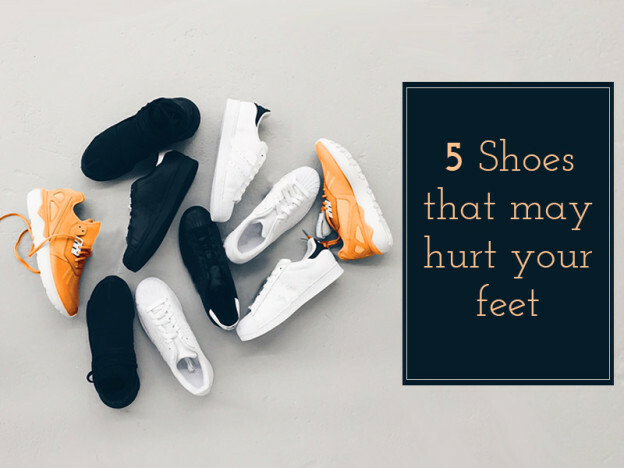 But there are many people who are bad in judging which shoe to wear – some of them wear sneakers for running or gym and others don't have enough knowledge how to style athletic shoes. It's important to be sure which shoe is suitable for activity. Improper Size: Its quite weird to understand that why people wear shoes which are not their feet size. This obviously cause swelling to your feet, thus making your foot weak. Unless you are sure about the particular shoe, don't buy! Sheepskin Shoes: Basically, these shoes are for those who are reside in colder place and tend to keep their feet warm. Its only reliable if you wear them when your feet can't bear cold otherwise its better to avoid them otherwise it will cause fungal infection. Rain Boots: These boots are basically worn for protecting your feet from rains and these are made from non-breathable and thick material. Its better if you wear in rains. It's time to be a smart shopper when we talk about shoes and buy yourself with an appropriate pair. A wise and mindful decision will give you benefit for longer terms.